Get answers about caseloads, class size, and other questions related to special education from the Virginia Education Association. Information from the Virginia Department of Education on Standards Based IEPs. 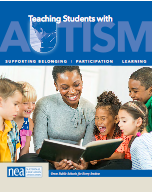 A tool kit to assist members of the school community in understanding and supporting students with autism. Let your students participate in their IEP meetings early. Download templates get ideas and more from the I'm Determined Project. Do2Learn has many resources for individuals with special needs. Learning games, communication cards, academics, employment, life skills, and transition are just a few of the activities provided on this site.